anotherjennifer recently posted..Dressing up. Just Because. Lovely, lovely flowers. 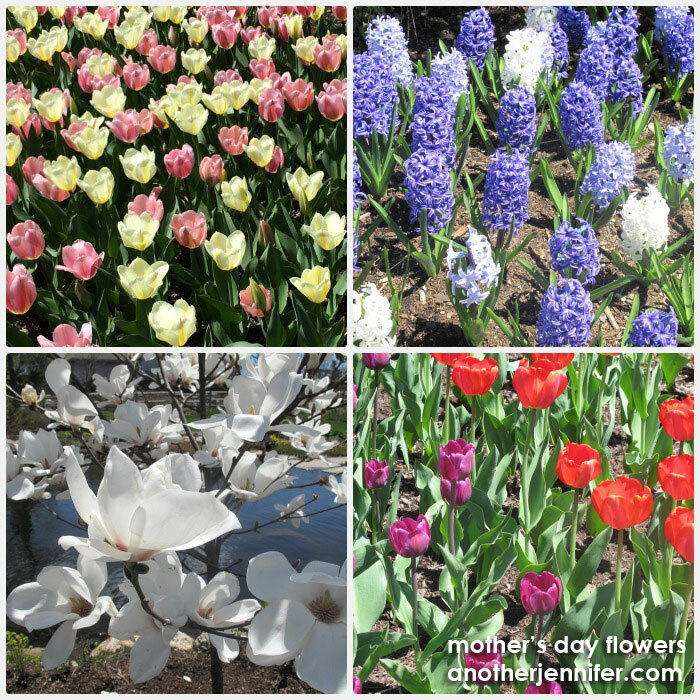 I hope you had an awesome Mother’s Day, Jennifer! Cathy Chester recently posted..What Did The Scale Say To Me? It was a great Mother’s Day, Cathy! Those are lovely! I’m so happy that Spring has finally sprung. We are all more than ready! It was such a long winter. I’m ready for consistently warm-ish weather at this point! I had a wonderful Mother’s Day, Iva! Hope you are still enjoying the post-Mother’s Day glow! Beautiful pics. Makes me want to shut down my laptop and play outside! It’s always a good idea to shut down the laptop and at least get some fresh air! I love hyacinth! I wish I could smell them through the computer!! Very pretty Mother’s Day flowers! Absolutely. These shots were taken at the Coastal Maine Botanical Gardens. Gorgeous. So beautiful! Hope you had a great Mother’s Day, Jennifer! Those are all beautiful but I really love those white ones in the bottom left corner. I can’t remember what those are, but I agree they are beautiful! Lovely photos! I cannot get enough flowers in the spring, especially after having such a harsh winter. I’m with you, Holly. The winter was brutal! They are such a classic flower, aren’t they? And I’m always impressed by all the different colors you find them in. I had a photo shoot today at Smith College campus and we found a garden bursting with tulips and gazebos. Tamara recently posted..Ten Things I Love About You. Amazing. One can never have enough gazebos really. It cracks me up to hear people complain about heat. I still haven’t put my fleece away yet! i think we are just a wee bit ahead of you in the flower department. Our tulips and hyacinths are done and faded. It’s on to the clematis now. Lovely to see these gems of yours. Maine takes a while to catch up to the rest of the country. I don’t typically feel comfortable planting anything new until after Memorial Day. That’s exactly why I wanted to a trip to the botanical gardens, Cathy! Perfect! I wish tulips would stick around throughout the summer. They are such a joy in the spring. Gorgeous! thanks for sharing these pics & for visiting me at Doorkeeper. Blessings! Gorgeous flowers! Spring is awesome, isn’t it? It is awesome, Alison. I wish it would feel more like spring. It was in the 50s and raining today. Yuck! Yes, wonderful photos, I really like those flowers, well captured!